Thou shalt decree a thing and it shall be established onto thee. This verse is probably one of the top 10 most-quoted things in Unity. What does it mean, and is it true? The following is a series of six articles from Weekly Unity, written by an independent New Thought writer, that slices and dices this Bible verse from the Book of Job every way you can imagine. For ministers, these articles are a ready-made Sunday lesson. For the rest of us, they are a glimpse into why our metaphysical efforts sometimes seem to work and sometimes seem to fail. Regardless, it may be time to take a deep dive into this often over-used quotation from the Book of Job. The articles were published between January 26, 1935 to March 2, 1935. I became aware of these articles when visiting Unity Church Universal at 9th and Tracy in Kansas City, where Rev. Greg Neteler, Senior Minister of Unity Church Universal, gave a series of Sunday lessons based on the content. You can watch Rev. Greg's lesson each Sunday at 11:00 am Central time at www.913tracy.org. 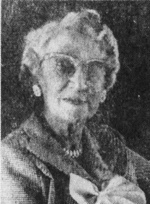 Marjorie M. Mohler was born in Kansas November 29, 1889 but moved to the San Diego are in the 1920s, where she lived most of her life. She died June 27, 1984. Marjorie was an independent writer who apparently submitted these articles to Unity in 1935. In 1963, about the time this photo was taken, she achieved a life-long desire by publishing Brave Heritage, a historical novel about post Civil War era reconstruction and struggles among the new settlers. The book is based on her family life in Wakefield, Kansas. Tuning in to the Infinite. Often it is not before some big problem comes into our life with which we are at an utter loss to know how to cope that we first start wondering if there really is any help in the teachings of the Master. Perhaps it is an illness, which the doctors have pronounced "incurable," perhaps it is the loss of a dear one to which we cannot reconcile ourselves, maybe it is a serious financial crisis, or some unhappy family relationship. Whatever the situation, it makes little difference, for the means of solving it always remains the same. I frequently have some one say to me when the first glimmer of Truth commences to dawn upon his consciousness: 'But it's all so complicated! I only wish I had the brains to " understand it." And yet the Master did not say we needed "brains" to comprehend or to apply His teachings. "Except ye ... become as little children," with the faith of a grain of mustard seed, with the calm, unhurried certitude of the lily of the field—that is all that is required of us! What could be simpler? It is we ourselves who make it difficult. Through the erection of seemly insurmountable walls we shut ourselves from the Truth. We have been doubting Thomases so long! So long have we crammed our minds with the weeds of doubt, fear, resentment, unforgiveness, lack! Having gone such a long way into the "far country" of negation, we are going to need time and work to return. Yet to clear the subconsciousness of all its tares and snares and rubbish and in their stead to plant the seed thoughts of life, love, power, faith, abundance, and health as a glorious adventure and an experience that will solve every problem that confronts us, leading us into the true freedom that is the rightful heritage of every human soul. Right where you are, in your own mind, is the place to commence. There is no other place to work, no other tool to work with. A change in your habit of thought and in your inner concepts will completely transform your whole objective world. The law of the universe is the law of compensation, of cause and effect. Watch the first cause (thought), and you will find that effect (experience) follows it "as the night the day." We are given the power to cooperate with the law, to choose our way as we will. The law never forces us. But the effect we can never control. Only through unifying ourselves with this law can we bring our desires into manifestation. If you habitually hold to thoughts of lack, talk lack with every one you meet, and believe that you must experience lack because of a race belief in "depressions," then you will most surely experience financial losses and hardships of every sort. But change these negative thoughts of lack to thoughts of abundance, plenty, overflowing riches, and believe with your whole being, then your life will be so full of good "that there shall not be room enough to receive it." That which you believe with deep conviction is exactly what you will experience in your health and affairs. "But how can I turn away from these error thoughts, these deep-seated concepts that are working such havoc in my life?" you ask. By right prayer and earnest study. "Thou shalt make thy prayer unto him." Go into your closet alone. Find a corner where you can be absolutely alone for a certain period every day. If this is impossible, then get up in the middle of the night when the family is asleep. You should have a time for regular meditation and study even if it is only fifteen minutes a day. The results will amaze you. If this time is in the evening or in the night, your sleep will be more refreshing than it has been. If it is in the early morning, you will go through the day with the ability to handle any problem that confronts you with greater confidence than heretofore. During this period of quiet the first important thing is to seek peace and poise of mind rather than the immediate solution to your problem. This will not be easy at first. We are so eager to make God understand, so anxious for Him to hear our prayers and answer them in just the way we think they should be answered that our minds fairly clamor with confused thoughts. But it must be done if you wish your prayers to be heard. You must still this outer confusion even if in the beginning it takes your entire meditation period. You must drop every worry, quiet every nerve and make yourself listen. An excellent drill in the training of one's senses to "Be still, and know" is to let your thought dwell on the presence and power of God. Look about you—at the chair in which you are seated, the furnishings in the room. Everything that you see was in its original substance first an idea in the great all-creative Mind. Allow your mind to wander further: to the flowers, the trees, the birds—all were originally thoughts in the mind of God. Think of the life that is back of everything, urging it into expression. Let your thought go up and out into the heavens until it embraces the very stars. There is no place in all God's universe where He is not. Now bring your thought back to your own body. Realize that there is not a single cell in your body that is not made and governed by this same power. Every atom of your body is charged with it and is only awaiting your recognition to spring forth into perfect being. Soon you will feel a peace stealing over you, a sense orrelaxation and joy that is a blessing in itself. This peace will carry healing and renewed life to every part of your body. Now you have truly tuned in to God, and you may speak your desire with calmness and assurance. Remember that the Father knows your needs before you ask and will supply them according to His law if you keep your mind open to His guidance and free of meddling and tampering. As you go about your study of Truth do not talk about what you are doing. Do not try to convert your family or friends even though you see their great need of the wonderful truths that you have "discovered." Convert yourself first. Keep your poise and above all your own counsel, until you have the realization of Truth so well established in your own consciousness that your words will carry power and conviction. Remember that deeds speak louder than words that are shouted from the housetops. If you are really living what you believe, your actions will be in accord and will be duly noticed. "I have the power to contact God now." As these words sink deep into your consciousness you will feel a growing realization of the presence and power of God everywhere about you. After all, this is the secret of dominion over every problem, no matter how trivial or how great. We have seen how to establish our unity with divine will through having a definite period each day in which to train our outer senses to be still and listen to the "still small voice" within. When we have established conscious contact with God we may state our prayer in clear, concise words. Now comes the promise that we shall be heard. What a positive statement! Yet many of us fall short of realizing this big vital truth. We enter the silence and make our prayers only to return to our daily tasks with the same negative attitude of mind as before. Then we wonder why we fail to demonstrate that which we seek. The truth is that we have dwelt so long on the material side of life, so long permitted the little imps of "ifs" and "buts" to dominate our reasoning minds and crowd out the deeper cosmic "knowing" that it takes real mental discipline to change the channel of our thought and lift it into a true conception ofperfection. "But," we argue, "suppose this should happen" or "What if that should come about"—and away flies our faith like a puff of smoke. All the good work done in the silence period is thereby annulled. True faith is not a reasoning faculty. It is not something born in the objective mind. It is something much more vital than that. It is a deep-seated emotion, a spiritual quality that knows no argument or reason. This is a very important distinction and one that we must fix firmly in our consciousness. The objective mind strives always to ascertain the why and wherefore of things, while faith accepts, often blindly. And unless you have faith it is useless to expect anything of the Lord (law). "But," you ask, "how can one who lacks faith acquire this dynamic attitude?" You do not need to acquire it; you already have it. If this were not so you would not draw another breath, take another step, eat another bite of food. You could not even live. You do not question whether you can do any of these things. You do not doubt that the sun will rise on the morrow. You are not concerned when you plant radish seeds lest they grow into roses. Your faith is really boundless when you stop to think about it. Then why not accept it further? "Ah, but those things are governed by law,"you say. "It is natural for the sun to shine, for us to walk upright, and so on." My friends, it is just as natural for God to give us all His blessings as it is for Him to give us just one or two. It is left to us how many of these blessings we shall accept. For that which we believe with deep conviction we shall surely experience. As each good quality has an opposing negative aspect so the opposite of faith is fear. Fear is the bugaboo that paralyzes every impulse to do the good that we would do but do not do because of its damning forces. If we truly want to live a successful, triumphant life, it is our business to weed out every vestige of this lurking evil and turn it into constructive belief. To strengthen our wabbly faith let us think on the good things that we already possess. Consider how they came into our life. We shall be surprised at the number of wonderful blessings we have been taking for granted—things to which we have never given a thought. Everything we have ever experienced and thoroughly enjoyed, from a jolly picnic to the acquiring of a new gown or piece of furniture, has come to us not through doubting fears, but because of confidence in some one or some thing. How much greater is our joy when we consciously place our trust on a high plane. "Faith," declared Paul, "is assurance of things hoped for, a conviction of things not seen.... By faith we understand that the worlds have been framed." Could a bird fly across the sky without faith that its wings are strong enough to bear it up? Then why cannot we exercise unswerving confidence that the great universal intelligence is sustaining us and will surely guide our steps aright if we but trust it implicitly, as do the birds of the air? "Let not your heart be troubled, neither let it be fearful." Put your faith to work today. For every fearful thought have ready a positive statement that will stamp it out of your mind forever. Have faith that the same wisdom that created every cell of your marvelous body can restore it to perfect health. Give God a chance by placing yourself wholly and completely in His hands. The same unfailing law applies also to your supply. If God had not wished you to have an overflowing abundance of His manifold blessings, He never would have permitted their creation. Above all, have faith in yourself, not in your material self but in your spiritual self, which is perfect. In Truth this self is the very essence of your being. It is the Christ in you that can accomplish every good thing that you can conceive if you trust it and give it outlet through your right attitude. An established attitude of faith brings poise of mind, stills fretful, jumpy nerves, gives the bodily organs a chance to function in harmony with the laws of nature. Faith is the very foundation of healing; it is the corner stone of supply Only in the calm, peaceful state of mind that comes from perfect faith can we hear the guiding voice within. That is why it is so essential that we should make our connection with infinite Mind before we utter a request. When we leave a period of silent "listening in," even though we have not asked for a single thing, we are flooded with a feeling of power and well-being. The world seems different; we are translated into a different realm. We are imbued with a feeling of peace that nothing can shake, our thoughts are thrilled with life, and our entire body is filled with light. It was this unquestioning, unswerving, absolutely unshakable trust that gave such power to the words of the Master. In all His teachings is the constant reminder to have faith; that without faith we can do nothing. Real faith needs no reasoning, for it knows, and knows that it knows. Let us have more faith in faith. In a deep-seated consciousness of perfect trust we shall experience the joys the untold blessings that are never-failing fruits of faith. This is the true beginning of the law and the second fundamental step toward attainment. The Dynamic Power of Gratitude. 22:27And thou shalt pay thy vows. Gratitude is one of the most potent, the most soul-stirring and far-reaching emotions there is. He who makes gratitude a part of his life transforms this world into a veritable paradise of happiness and harmony. In reality gratitude is a form of blessing. As we persistently radiate this glorious state of mind we are constantly sending forth a blessing upon everything and every one with whom we come in contact, a blessing that by all the laws of the universe returns to bless and prosper us a thousandfold. The person who is eternally grateful for the things he already has is open to a far closer and more intimate contact with God than he who never utters a single word of praise or thanksgiving for the good that surrounds him on every side. Gratitude is like the leaven to the bread. It is the active quality that not only attracts good things but causes them to increase as well. Why? Because it harmonizes our finite mind with the cosmic intelligence and acts as the perfect unifier between ourselves and God. Only through complying with the law of gratitude can the good that we desire come into expression in our life. It is when we fail to obey the law that inharmonious conditions arise. Gratitude keeps the mind poised as wings balance a bird in flight. It prevents our thoughts from slipping into the Slough of Despond—dissatisfaction, discouragement, faultfinding, and self-pity, and all the rest of the long train of negative thoughts that we all too often permit to dominate our mind. Ingratitude is the stamp of selfishness. Like criticism it has its origin in a swollen ego and an exaggerated sense of our own importance. We become so wrapped up in ourselves, so "introverted" that we are blinded to any viewpoint beyond our own narrow one. Many times such a mental condition in itself is sufficient to cause a nervous breakdown and other similar ailments. On the other hand, true gratitude feeds our hopes, nourishes our faith, and causes creative power to become manifest in our affairs as success, prosperity, health, happiness, and love. The grateful man is the happy man. The faultfinding, sharp-tongued, critical, discontented, complaining person is just the opposite. Dicf you ever see a truly grateful person with a frown puckering his forehead? Not a bit of it! His face is usually so wreathed in smiles' that it is positively beaming. Not so with our faultfinding neighbor. To him everything in the universe is wrong. He is out of money, out of work (or soon will be if he keeps on with his grumbling), his health is bad, and, generally, he is quite convinced that the whole world is against him. Soon, too, even his best friends begin to shun him, for no one wants a chronic grouch around for long. The strange part of it is, such persons always blame every one but themselves for their troubles. There is a thinking substance everywhere present, constantly at work creating new conditions in our life, new cells in our body exactly according to the orders" received from the intelligence higher up. Therefore it behooves us to be ever on our guard, to fix our minds constantly on the good that we desire to objectify, seeing it as ours already, praising it, and giving sincere, heartfelt thanks for it. The natural reaction to spontaneous gratitude is faith. And unshakable faith begets gratitude. One is inseparable from the other. And because every single thing we see and use and experience contributes to our good, our growth, we should be grateful for all things. "Choose you this day whom ye will serve." Will you serve your innermost divine self, which is capable of dominion over every single thing in your experience, or will you serve the tiny, physical, limited self, which is swayed by every passing whim of negative fancy? "The whole process of mental adjustment and atonement can be summed up in the one word gratitude," says Wallace D. Wattles in his amazing book Financial Success through Creative Thought. "Many people who order their lives rightly in all other ways are kept in poverty by their lack of gratitude. The grateful outreaching of your mind in thankful praise to the Supreme Being is a liberation or expenditure or force; it cannot fail to reach that to which it is addressed, and the reaction is an instantaneous movement toward you." A powerful statement, but every word of it is true. Whatever you can improve upon will surely bring you success. There is only one way, one avenue to improvement, and that is through the gateway of your thoughts. Each one of us is an expression of God, a center of divine activity, surrounded, permeated, and interpenetrated by a boundless ocean of Spirit. Every thought we think sinks into this great ocean and brings forth after its kind. Why do we continually separate ourselves from the good that is ours by divine right through our giving way to mean, petty little thoughts of selfishness, self-pity, and self-indulgence, thus constantly bringing upon ourselves the very conditions we do not want. There is not a moment of our conscious lives that we cannot turn instantly to this great power within us, this self which is the same self that was in Christ Jesus, eternally perfect, eternally powerful. What a blessed privilege! That alone should make us so grateful that we should never want to expend another second in mental groveling. Let us determine right now—for it takes determination and real courage to change habits of long standing, to be grateful for every single thing in our lives. To vow that not another word of complaint or faultfinding shall pass our lips again; that we will so fasten our attention on all the blessings that infold us that there will not be a chance for another critical, discontented thought ever to enter our minds for an instant. Instead let us hold our thoughts to the best, and as surely as God's promises are living truth, the best will come back to us. Even those conditions which seem anything but good for the time being in reality are good. Misfortunes come because we have in some way misapplied the law. As we grow in understanding and see these so-called misfortunes as blessed steps toward advancement and self-mastery they will vanish like the mists of the morning, never to harass us again. Is not this in itself cause for great rejoicing? It seems almost unbelievable that just being grateful can do so much to change our lives. Christ knew the potency of gratitude for He seemed to cultivate a continual attitude of praise and thanksgiving as He went about doing His marvelous works. Every miracle He performed was accomplished with a prayer of adoration and gratitude on His lips. Never once did He fail to give thanks; to rejoice that that for wnich He asked was already His, even before His request was expressed. What a different attitude was His from that held by the majority of us! "I am grateful for this day and for the chance to prove my dominion over every problem it may bring." Let this be our waking thought, and may we hold to it unwaveringly throughout the day. And as surely as the night follows the day, good will be manifested in all our ways. To decree a thing we must first have a clear, definite understanding of what we want to accomplish or bring into being. Whether it be health, money for a certain purpose, the attainment of some goal in a specific line of work, there must be positive purpose of which we are very sure. The desires that lie buried far beneath the surface in every one of us are the guideposts to our goal. These desires indicate the real purpose of our life, the objective toward which the Creator intends us to work. The desire to express health, abundance, beauty, happiness is a rightful desire and as natural to every individual as is breathing itself. Often we have a fear that our aspiratons are too great for us possibly to attain them; that we are asking too much. We cannot possibly ask too much. Our chief trouble is that we do not ask enough, for God's substance is limitless—more abundant than we can ever conceive. "Desire is the thing itself in incipiency, and carries within itself the power of its own fulfillment." It is a spiritual quality and indicates a real need in our lives, showing in what direction we can best express our highest and truest selves. When the channel is shut off or inhibited for some reason or other, desire finds an outlet in misdirected energies such as disease and perversion of all sorts, and brings about unhappiness and disaster. Fear of one kind or another is invariably the agent that distorts our reason, inhibits and forestalls our good desires, and turns them into evil and destructive ways. As the urge that lies in the heart of a tiny seed causes it to climb "to a soul in grass and flowers," so is there inherent within the soul of every one of us a hunger to be or to do something truly worth while. Yet unlike the tiny seed that knows its nature and never, never makes a mistake, we human beings often waver. We are uncertain what objective to select, what aim to head for, what decision to make at nearly every crossroads of our life. There is always one sure, unfailing way to find guidance, regardless of what your demand may be. That is by turning within, to the infinite Mind, and placing yourself in the hands of the Father who knows your need far better than you do. Pray for guidance and understanding, and the right decision will surely come, even though its desirability is not at once apparent. Act fearlessly upon whatever leading the Spirit gives you, and eventually you will see the wisdom of the course you have taken. Ask with authority like a son of God, which in truth you are. Claim that which you desire, and by the very nature of your Godhead you have the power to manifest it. Your part is to trust the inner urge without question, knowing that it is your inherent destiny. Decree what you desire in faith and thanksgiving. Acknowledge it now in the fullness of Truth, and the way of its achievement will be opened to you. Everywhere about us, surrounding us, penetrating and interpenetrating our very being is a substance that is highly sensitive to our every thought. We are constantly molding it into form by each thought we think and every word we speak. Why do we not use it consciously and thus have supreme mastery over every inharmonious condition! In the subconscious mind fear has the same action as desire. This part of our mind knows no distinction between the two. That is why when we fear a thing, it is that which comes upon us, rather than the good that our higher sense really wants. We unconsciously place the power of our faith on the negative side instead of the positive, and in consequence reap exactly what we sow. I once had a very beautiful Persian kitten to which I had become tremendously attached. It was a smart little thing, and I had taught it many clever tricks. But always lurking in the back of my mind was the fear that something might happen to it. Especially did I feel this fear when coming across some one else's pet lying in the street, the pitiful victim of traffic. My heart always yearned over these disasters, and the fear grew in my subconscious mind that some day such an accident might happen to my own loved pet. And of course it did. It was not until then that I realized that through my fear I had really contributed to the accident that killed my own pet. I began to wonder how many parents were holding similar subconscious fears or "desires" with respect to their little children. Now, whenever I pass animals or children playing along the street I utter a prayer of protection for them and thank God that no harm can possibly come to them, since they abide "under the shadow of the Almighty." Not long ago I heard a lecture by a noted psychiatrist, who explained more fully the workings of this unconscious part of us. She said: "We are given the power of choice to make our lives exactly what we choose. The subconscious mind records everything it sees, whether your objective or reasoning mind is aware of this fact or not. Hence, we must be constantly on guard to keep it from registering false concepts. This can only be done through the cooperation of infinite Mind, and by instilling into the subconscious mind the firm principles of the highest good. Even though the subconscious mind is predominant it always takes its key from the objective mind. Therefore, if the reasoning mind harbors negative thoughts the subconscious mind will invariably be on the alert to accept them as true, record them, and eventually bring them to the surface in all sorts of unhappy experiences." The more thoroughly we understand and study the unseen forces of our nature the better equipped we are to train and guide them into constructive channels of expression, thus releasing ourselves from the disastrous results of their wrong use. Therefore, be definite. Know what you want, and keep your mind fixed firmly on what you wish to have demonstrated in your life. Hold everything in the material world in its highest and truest relationship to the presence and power of God, and dismiss from your mind all fear of competition or failure. In the spiritual realm there are no external obstacles that can in any way keep you from realizing your heaven here on earth now. Know that in dealing with creative Mind you are lifted up above the feeling that this or that person, thing, or condition can possibly block your progress and you realize that "all things are possible to him that believeth." What a powerful statement of assurance this is! Not "it may be" or "it might be," but "it shall be" established unto you. "If any of you lacketh ... let him ask of God, who giveth to all liberally ... and it shall be given him. But let him ask in faith, nothing doubting." This is the same promise couched in but slightly different words. If you can grasp the full significance of this mighty truth and believe it with every fiber of your being, then you are master of every pitfall of vacillating doubt that may lie in your path. In the perfect realm of creative Mind your innermost desires and the way to their fulfillment are one. Desire is but the signpost that points the way to your objective. If this buried urge was not God's will for you, it would not be there clamoring for an outlet. It is a spiritual quality showing that you have definite need for expression in a particular direction. It is the promise of its own fulfillment, since the desire and the way to its crowning conclusion are one. Deep within each one of us is an amazing power that is capable of meeting every demand we may make upon it. Every problem can be solved by it, every inharmony adjusted, every desire that is in accordance with law brought to a glorious consummation. It is because we continually look to outside conditions for the cause of our troubles, our bitter experiences, our heartaches that we fail to find the remedy. We ourselves are the instruments through which the law operates. It is only through us that the law can act to bring about our highest good, and even then it can act only to the extent of our conception and recognition of it. To learn to work in accord with the law and abide in the everlasting awareness of its presence and its power is to have dominion over everything, good or ill, in our lives. Freedom, happiness, abundance, health, success, all are ours for the taking. These are not just high-sounding words, but statements of fact with which every one who sincerely puts them to the test will agree. It is the steadfast knowing, the calm, quiet, positive expectancy, the consciousness of God that sees all with the inner vision of Spirit that flings wide the door to the kingdom (control) of heaven (happiness) here on earth. Scientists are repeatedly telling us that this material world is not at all what it appears to be on the surface. Cooperating to produce everything we see are millions of infinitesimal whirling electromagnetic atoms. Contained in each tiny atom is a positively charged nucleus of protons, surrounded by an envelope of electrons. On the number of these electrons is based the difference between the various forms of matter. Through the steady, slow passage of time these atoms are constantly undergoing change in relation to each other without changing in themselves. They are impelled by a highly sensitized intelligence, which holds them in their course and guides them by an immutable law that is changeless and unchangeable. Thus creation is going on about us all the time, bringing forth new leaves on lifeless-looking limbs and fashioning new cells in every part of our bodies. But why bother about all these scientific data? you ask. What difference does it make whether we know all this or not? Well, it does prove to us beyond the shadow of a doubt that there is no such thing as a solid—that what we thought was fixed in reality possesses fluidity and movement. The bones of our bodies, for instance, are not solid at all, but are made up of highly active atoms subject to the control of thought. Man has been endowed with a privilege above all other forms of life. Where the. animal and the vegetable kingdom have been invested with the power of instinct, man has been granted the power of choice through the transcendent gift of thought. It does not matter where we live, what our work is, what our situation may be; right where we are is the place to contact God. It is by using this glorious power of thought that new wisdom and understanding are unveiled to us, and new vistas revealed to happier and more splendid experiences. said Cassius. Speak the words of authority that will set you free, for it is up to you to choose whether you will be an "underling" or the "master" of your fate. There is only one thing that can hold you back, and that is negative thought in one or another of its many destructive forms. Worry, jealousy, anger, greed, envy, a feeling of inferiority, selfishness, fear of sickness, of poverty, of lack, of failure; these are the stumbling blocks in the path of our good intentions; are the concepts that prevent us from claiming our innermost desires in the transcendent joy of their realization. Divine Mind is creative, purposeful, dynamic—a force that knows no limitation when rightfully used. The human mind is like an electric light bulb attached to a socket in that it is potentially one with the great electrical current of life. It remains with us whether we shall turn the switch and flood our lives with radiant light or remain in the darkness of ignorance and doubt. God never forces us. We stand or fall according to our own choice. One thing is certain. We can never get away from our ultimate goal, the plan which infinite intelligence has in mind for us. But we can shorten the route and make plain and easy the way through our determination to learn the Truth here and now and live it with all our might. Surely there is nothing so vital, so soul-inspiring, so much worth striving for. To hold unwaveringly to the promise of the Master that "whatsoever a man soweth, that shall he also reap," to key our energies and our attention to the mighty attitude of knowing that is the very essence of faith; to tune our emotions to deep and profound gratitude for everything in our lives both manifest and unmanifest is to "establish our feet in the firmament of the Almighty." Then do we indeed hold in our hands the key to a success and happiness that brings into outward expression the joyous fulfillment of every good we can possibly conceive. 22:28And light shall shine upon thy ways. As I sit here at my desk the lilting song of a mocking bird comes pouring through my window, a perfect paean of joy. My own heart responds and rejoices with him. There is a magic in joy that makes every cell of one's body thrill to it. Hard places are made easy, burdens converted into blessed privileges, and tears of sadness transformed into brilliant rainbows when its song is singing in our souls. The very word "joy" hums with vibrations. If you do not believe it try repeating it over and over, slowly, distinctly, letting it sink deeper and deeper into your consciousness. Soon every nerve of your body will commence to tingle, and you will feel the urge to dance, sing, and express this inexplainable emotion in bubbling action. It is impossible to feel joy and not radiate it to every one you meet. Have you not known folks who were naturally joyous, and were you not drawn to them instantly like a bee to a flower that is brimming with honey? Joy acts as a powerful magnet that attracts to you all sorts of unexpected blessings, without reference to any conscious effort on your part. To know and understand this spiritual emotion is to cooperate with a force whose power is limitless. Its influence rolls on and on, gaining momentum as it goes. But first we must be strong in faith, else we are apt to fall by the wayside. We are apt to be swayed by chance negative remarks which our subconscious mind, not yet firmly established in Truth, accepts as true. Our power is measured according to the amount of our self-confidence. And unless our understanding is sufficiently stable to withstand the dampening effect of the suggestions continuously being poured into the race consciousness by negative minds about us, we are likely to experience the same sort of emotional upsets as a young woman who came to me one day and said: "Why is it that I am constantly either walking on air or else down in the dumps? Goodness knows, I try hard enough to be more poised!" "Because,"I told her, "you have not yet learned to depend solely upon the higher spiritual self deep within you, which knows the truth of your being and knows that it knows." The glad heart is the peaceful, healthy, prosperous one. Joy is the supreme reward of our recognition of God as certainty. It is because we feel separate from God that we lose the sense of His security surrounding us, infolding us, protecting us every moment of our lives. We can never separate ourselves from God except through our belief that God manifests Himself on a different plane. God is everywhere present. There is no such thing as separation; for "closer is He than breathing, and nearer than hands and feet." Nearer than the breath we draw. The sooner we grasp this fundamental Truth and imbed it deep in our consciousness the sooner shall we manifest true freedom from every limitation that binds us. When we have recognized the fact that God is always with us we do not have to strive and strain to change unhappy, inharmonious conditions, for they will change themselves so naturally that we shall scarcely be aware of what is happening. This is the law, changeless, immutable. Believe it! Trust it! Rejoice in it! And radiate your joy to all the world. Joy is catching—as contagious as love. And if you never do a thing beyond spreading this glorious gospel of light into every heart you meet, your life will indeed be a blessed triumph. "The joy of Jehovah is your strength." It is the true light of the world, the very essence of spiritual understanding. "Give thanks in words." Paul says, "In everything give thanks." Such a state of spiritual gladness keeps the nerves poised, the body filled with life, and stimulates the brain cells. This in turn releases the imagination, making us open channels through which creative Mind can operate to lead us on to undreamed-of accomplishments. Hence, if you have been going about with a long countenance, lamenting financial losses or lack of health, right now is the time to about-face. In place of grumbling about your misfortunes, try laughing at them instead. When your vision has been lifted from the dark magnifying glass that has altered your perspective, you will be surprised to perceive that many of your mountains were only molehills and that some of your seeming misfortunes were blessings in disguise. It is like a hill in the road. When approached from the bottom it looks terrifyingly steep, but as you ascend, it seems to flatten out until you wonder why you ever thought it steep at all. I never come to such a hill that it does not remind me of the attitude that we take toward so many of life's experiences. A glorious new era is in the throes of birth. It is bursting forth on every side. As has always been the case, the old chaos of selfishness, of false concepts, and materialism must make way before the victory of order. Those who are dropping the scales of doubt, fear, and gloom from their eyes are already commencing to see the light of a new day, and are preparing to reap the rewards it promises. "Arise, shine; for thy light is come." The light of the law is joy—the flower of understanding come to its full fruition. Know that that which your soul craves is yours now in the invisible realm of true substance, and that as you express your faith (cause it to flow out) in rejoicing, praise, and eager expectancy, so shall it certainly become manifest to you. "But how can one acquire this attitude of praise and thanksgiving when one feels anything but joyful?" many have asked. That question puzzled me too for a long time. Then came the. answer. God is joy, God is everywhere present. Then joy is everywhere present, in every atom of the universe. It throbs from the throat of tiny birds; it pours from the exquisite tints of flowers and sunsets; it shines in the sparkling brilliance of the stars. If this is so, then joy also permeates every cell of my being. I cannot possibly be separate, from it. I feel its thrilling life now. I sing and dance with joy. Persist in affirming joy until your heart is lifted up in gladness, for unless your affirmations strike deep into the emotions they have little power. All things gather where life is a song!" So sings the poet. Drop your troubles just for today. Let go of every care and worry and give yourself wholly, unreservedly to this joyous reaction. Thereafter you will never need any further assurance that you are working with an immutable law, which knows no failure, no sickness, no sadness, no depression, no loss, which is the very embodiment of good, by virtue of which happiness, peace, and power are objectified in your life. And light shall shine upon thy ways." You now have seen how the text that we have been following in this series of articles embodies the six fundamental steps of scientific prayer. You have seen that true prayer is not just a few jumbled words poured out in a frenzy of beseeching, but an attitude of mind based on emotion that must be lived in order to be made real. No rule is of any use that does not work foryou. Use this knowledge now. Put it to the test. Unify yourself with cosmic Mind through the silence. Then make your request. Know that you are heard. Give profound thanks that that for which you have asked is already yours. Know that it is "done." And last but by no means least, open wide your being to joy, that singing, triumphant emotion which illumines all your ways with a radiance unsurpassed. "All things are possible to him that believeth." Exult, be glad, for "the kingdom of heaven is at hand." Claim your rightful heritage now and go forth with courage. For has it not been given unto you to be conquerors of the earth? Transcribed by Mark Hicks on 6-6-2016.